Driving around Ireland on our trip to Donegal this year we are constantly asked from lamp-posts, billboards and news media a very complex question with a stark either/or answer: Yes or No. Yes gives women the right to choose whether they should have the right to decide for themselves if they want to have a baby within the first 12 weeks of pregnancy or whether the state has a say in the matter. I remember the 1983 referendum when abortion was outlawed through the constitution in all circumstances in Ireland and we became aware of the Society for the Protection of the Unborn Child (SPUC) for the first time. The strange spectacle of very respectable looking women, priests and small, confused children, brandishing posters with horrific pictures of aborted foetuses in buckets or on the end of surgeon’s knives, screaming blood-curdling slogans, became familiar outside the GPO and elsewhere. These were strange times in Ireland with the Church trying to reassert its waning control over a changing society, successive governments were imploding through scandal and corruption and emigration was running at 1950’s levels. It is a bit unnerving to see the same arguments played out again at least this time without the gruesome imagery attached although we have seen Downs’s syndrome children used in the No campaign but the Church is keeping out of it. That is the Catholic Church not the American alt-right Evangelist Churches who got behind Trump and who also back Israel in everything they do, however un-Christian and who seem to be very much involved in the No campaign. I am not suggesting that No voters are inherently right-wing just that the extreme right does champion the crazy end of anti-abortion activity, including bombing clinics. As an odd postscript to the abortion debate, Colm from Fermanagh got in touch with John a few months back hoping to trace his father who he had never met. His mother told him before Colm’s upcoming wedding that his real father was a Clare man she knew in London when she lived there in the 80’s. There was no relationship and she had returned to Ireland telling him nothing about the baby she was carrying. So with only the name and the county to go on It seemed to be a needle in a haystack job but that has never stopped John before and he somehow managed to find the man in question. 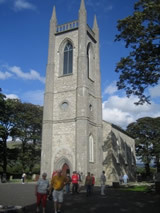 He was back in Clare after years in London where he had a family, later returning to Ireland, settled down and had another family. John arranged for Colm and his father to speak together by phone at first. We were passing through his home town on the way to Donegal from the Dublin ferry and called to see Colm during his break from work. He was still buzzing from all the unexpectedly exciting news he had to contend with and the coming nuptials and we were all fascinated to hear the story from Colm’s point of view with further commentary from John on his search for the father. Colm told us that his father had a suspicion that his mother was pregnant when she told him she was going back home but she had denied it. It was a strange reversal of the well-worn abortion trail to London from Ireland so familiar to us particularly at this time. The mother had also told Colm that she wasn’t certain that our man was the father and she suggested they both take a paternity test which they agreed to and which thankfully turned out positive. We left Colm with his effusive thanks to John ringing in our ears and bags full of pastries he had bought for us for the road to Donegal. The other binary decision that is affecting life in Ireland even more so than in its country of origin is of course Brexit, a word coined a mere two years ago but which is indispensable today. Think of all the time we have saved by not having to say ‘Leaving the European Union’ or ‘Unattaching Britain from the EU’ every time the debacle was discussed. Crossing the border is a joy today not least because these days the roads on the northern end are worse than in the 26 counties (obviously Arlene’s billion hasn’t gone on infrastructure). For the last few years, we have gotten used to the fact that is as obvious as the noses on our faces: that Ireland is one country to the vast majority of us no matter what those at the extremes of Irish and British opinion would have us believe. The stark binary choices imposed on us these days have their roots in various forms of extremism, which have distorted very simple facts and blinded us to the blindingly obvious: we should be free to choose our future and ignore those whose only answer to any question seems to be No. We visited Derry, as is our habit when in Donegal. We usually have someone from the town or county with us and it is always a pleasure. I was curious to see Free Derry Corner this time as I had seen a picture on Facebook of the monument to plucky Derry people who resisted the might of the British Empire from their humble terraced streets. Many of the streets were completely destroyed and burned to the ground but the gable wall of one is left standing with the legend, ‘You Are Now Entering Free Derry’ painted on it in three foot high letters to proclaim that resistance. The picture I had seen had the gable wall repainted in the colours of the Palestinian flag. When we got there, the famous wall was its usual white so the picture was probably either photo-shopped or had been draped in a giant flag. Either way it spoke of a truth that the Nationalists from here do indeed identify strongly with the Palestinian people and other people standing up to massively stronger opposition. Even these days what happened in Derry all those years ago is not very widely known and an exhibition at the Nerve Centre Gallery, appropriately in the old vacated army barracks in the city hopes to inform people about the Civil Rights Movement, whose march in Derry marked the beginning of what was euphemistically called The Troubles. Today, 50 years later, the photographs and news film of the march shown here still have the power to shock. The immediacy of close-up footage of coppers battering ordinary men and women who were campaigning for the right to vote are shown alongside similar imagery from the beginning of Black civil rights protests in Selma in ’63, the Prague Spring and the Paris uprising also in ‘68. The exhibition is called The Lost Moment?, which suggests a view that the civil rights march on 5th October 1968 represents a lost moment in the history of Ireland. After the brutality of the British State’s response to a peaceful march for democracy, there was no chance of a negotiated settlement and it marked a turning point that led to armed insurrection and ultimately 30 years of war. For the first time in 20 years, Brexit has put that peace at risk with the seeming inevitability of a border being enforced between the northern counties and the EU. This is not about Irish opinion on either side of the border and we know that hardly anyone wants a hard border but there is no other way when we consider the position of Ireland within the European trading block. The UK government can deny the fact but the reality is that the northern counties cannot operate as part of the UK and part of the EU at the same time after Britain leaves. Certain members of Theresa May’s Crazy Gang in charge of the Brexit negotiations let slip occasionally their real agenda when asked they say that they don’t want a border so it would be up to the EU and Ireland to impose one if they want to. I suspect that this deeply cynical view is the truth but the idea that the UK will get a favourable trading deal while playing these kinds of games is a fantasy that is no longer funny or tolerable. While in Derry, we called in to see a new friend of Aisling who works in the city in a Georgian town house just above the Bogside. Daniel contacted us out-of-the-blue a couple of months ago. He had seen our website and was interested in the work that Aisling does. We found out that his interest had a personal touch: Daniel came to London seeking his fortune in the mid 80’s like many thousands of young Irish people and like many Irish people he also drank too much and was homeless for a time. He managed to make it home to Derry though and he set about putting his life back together, seeking help with his alcohol use and organising his future career. It turned out he was gifted with figures and became an accountant and was so determined to succeed that he even asked accountancy firms to take him on for a year at no cost so that he could learn the ropes. One such firm that turned him down was based in the office he now occupies and where he was telling his story to myself, John and two of the men who had come from London with us. He now owns the whole building so it was a very satisfying outcome. He is not only an accountant either but is also very much involved in property development and showed us some very impressive plans for projects in Donegal that he hoped Aisling could use some times. That evening Daniel and his friend Pat who is part of the Donegal/Glasgow/Donegal diaspora who retired back here, met us for dinner in the Redcastle Hotel across Lough Foyle. We caught the ferry over from Magilligan to Greencastle. There we called in to see Philip’s brother and sister in law who have perfectly restored an ould Irish cottage with the recent addition of two miniature ponies, which you could put in your pocket and walk away with (You really could). Driving down from the road to the hotel just past the hotel golf course, the hotel stands out on a promontory over the full expanse of the Lough at its most expansive. The best vantage point is in the dining room where we sat in front of a vast picture window filled with the grandeur of the great waterway, which is the border with the north. The British claim rights to the whole of the Lough somehow as the they do to Carlingford Lough in the east where Charlie Haughey’s boat was once boarded by the British coast guard when he was the Taoiseach. 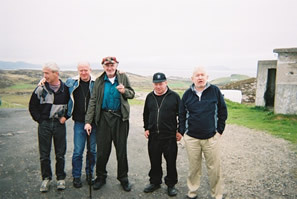 Due to the disputed territory, the oyster fishermen on the Donegal side manage to escape any regulation of their activities. The meal was nouvelle, which meant that although we could eat a horse (full sized) we were given food more remarkable for its presentation than its quantity but between the three courses we had enough to eat and we left Pat and Daniel to fight over the bill. Once again, we were staying in Pat Logue’s (he of the wonderful Sheephaven Bay pub in Camden Town) family house in Downings and are welcomed by Pat’s cousin Hugh and his wife Doreen who make sure we know where everything is and give us a basic beginner’s guide to the Sky TV package. Access to football and other sports is essential to Pat’s business and his pub has various sports TV packages from around the world in order to be a step ahead of the competition in catering to the many and varied international sports fanatics from around the world who come to his pub in the cosmopolitan rich Camden Town. Camden, once an Irish town in North London has become in later years a mecca for a vast and varied number of foreign visitors as well as those rich enough and lucky enough to have resettled there. Many fans have found their way to the Sheep and Pat is happy to accommodate those from all over the world including Latin America, Europe and beyond who wish to see matches by their various teams. Some have even made the pub the official London fan club of their team and have found a welcome home from home at the Sheephaven Bay. As we have here in Downings for our own diaspora. A place we can relax and visit families and the real Sheephaven Bay, which is part of the incredible view from the hill above the Logue family home. There is another incredible view just outside the house across the estuary of the Fanad peninsula where we head off on the afternoon we arrive at Downings, across the Harry Blaney Bridge. This is one of the most beautiful and unspoilt parts of Donegal with little evidence of the unregulated sprawl of the bungalow blitz to be found east of here in parts of Inishowen and in Letterkenny. We stop for a while at The Lighthouse (the pub) for tea and sandwiches. The place is going through a refurbishment, which John is fearful will ruin the character of the pub. One worrying aspect is that they seem to be fitting frosted glass, which will likely obscure the word-class view of Fanad Head and their eponymous lighthouse. If so it seems like a self-inflicted shot in the foot for the any business gifted such a natural advantage. No such problems in Downings where the Beach Hotel is well placed to take advantage of the spectacular views over Sheephaven Bay. Hugh, Doreen and Gerry Logue Pat’s brother took us there for a big dinner one evening courtesy of Pat, our most steadfast benefactor even when he’s hundreds of miles away. We wouldn’t be seeing much of the various Logue’s on this trip as there was a big family wedding coming up. Further north and east is the remarkable Famine village experience at Doagh at the top of Inishowen peninsula not far from Malin Head, the most northerly part of Ireland. This is an extraordinarily surreal experience and well worth the journey not least for the unspoilt splendor of the coastline. A collection of old style cottages cluster around an open courtyard a bit like a small village square. The tour starts in one of these, which is the family home of Pat the tour guide, where his family lived until the early 80’s. Here Pat tells us about his family’s life here living at subsistence level on the land, his parents and ancestors bringing up large families in the tiny house. Pat explained the anomaly found wherever poverty exists that those with the least inevitably rear large families as an investment in their future. The diet was mostly potatoes and milk supplemented by seaweed and occasional meat. Despite the sea on the doorstep, fish was rare around here and because of the peculiarities of the coast, fishing was tricky, carried out with very long beach casting rods. There’s plenty going on in Donegal but it is such a difficult county to get around that we always end up driving a great deal in and out of the various peninsulas spreading north like fingers from the hub of Letterkenny. The largest town in Donegal is a mess with the main street much like any other Irish town featuring shops, pubs and restaurants but like few others, it has been blighted by the most out of town developments in one town I at least have ever seen in Ireland, which is saying something. Out-of-town hardly conveys the massive sprawl of warehouses and prefabs, which crowd for space between the main street and the N25, featuring every consumer outlet known to man and a few known only to women. I’ve said it before but Donegal seems to suffer from a serious lack of planning which has destroyed any character there ever was in Letterkenny and other outlying parts of the county. Aisling was travelling light on this occasion. Jimmy was looking forward to the trip and John had prepared him over several months to the extent that he had cut down so much on the drink that he was only having six cans of Holsten Pils a day. We had packed enough for him to get through the trip at such a discount from Morrison’s that I was thinking of going on the stuff myself. Jimmy was from Leitrim and had not been home since he first left Ireland. He is one of those remarkable people who had managed to live his whole working life in London without any engagement with the state on any kind of official level whatsoever. He had worked cash in hand and had never signed on or, it seems taken ill. Eventually there was no more work, no cheap digs and he ended up on the streets. John had managed to get Jimmy into Chichester Rd hostel in South Kilburn, run by St. Mungos homeless charity and he is happy there with other Irish men of his own age and habits. Getting him home had seemed unlikely but he had become excited about the prospect lately and this was his best chance as we planned to go through Leitrim on the road to Donegal. The idea was that Jimmy could have a look around for an hour or two but he was not yet ready to look up any of his family and maybe we would tackle that job at a later stage. We had picked up the rest of our group at Camden, Jimmy was last pick-up and there he was outside the hostel as we turned the corner into the street. There he was waving a can of Holsten in the air staggering about as the minibus pulled up. Behind him was his key worker with his suitcase but Jimmy was in no mood to travel. Jimmy wished us all the best and a safe journey but there was no way he was coming with us no matter what we said. He seemed to think we were crazy for even thinking he would go through with such an outlandish idea, and maybe we were. Maybe we have been crazy for years thinking that we could crack the habits of a lifetime and intervene in someone’s life in such a way that could transform it. Maybe Jimmy would one day manage to do what he truly wanted to do and make a great leap and travel a few hundred miles with friends to make contact with the home he left and never stopped thinking about, reading about and talking about. Maybe some other day. The minibus was light coming back too as three other men stayed home in Ireland. We dropped Tom off in Longford where he was to spend a few weeks with his family, Terry too decided to spend time with his sister (God help her) and Philip was going to spend time with his brother working on another farmhouse rescue in the ould style. So there were only three of us to book into the Russel Court Hotel on Dublin’s Harcourt Street. The hotel constitutes three huge Georgian terraced house and looks very grand from the outside. Inside it is oddly garish with regency type chairs, tables and sofas in the reception area, painted pink and upholstered in shiny plastic and tabletops in black marble-effect. The bedrooms are high ceilinged but narrow with the furniture packed in so you have to turn sideways to get to bed from where you can at least reach the telly easily without the need of a remote. That evening we met Joe McGarry and my cousin Pat in the lobby and went out to find somewhere to eat while lots of young people were gathering around outside the hotel on the street talking excitedly in many different languages and accents. We had a very satisfying pub meal in The Bleeding Horse on Camden Street. Joe filled us in on the plans he had for the Aisling Resettlement Centre with which he was making great headway with his religious contacts, more of which to come. After the meal (fish and chips, Guinness stew, chicken curry) Joe headed back to his new home in Kildare, John and Kieran went back to the hotel and I went with Pat my cousin for few pints around our old haunts. Not too much later back at the hotel the place was hopping. All the young people we had seen gathering outside the hotel were now inside plus hundreds more. The back of the place was one massive heaving disco, which spilled out onto a back garden terrace. Anyway, I needed to get to bed if I was going to be fresh for the drive home in the morning. Not a chance. My room was at the back of the building on the first floor and there was no soundproofing. John and Kieran were on the third floor at the front and the music was a distant thump, thump, thump. In my room it was an ever present THUMP,THUMP,THUMP with blood curdling howls throughout. I’d never heard anything like it even in the Underground at the Worlds End, the death metal centre of Camden. I called reception and shouted to make myself heard. “What time does the music stop?” “Four AM! It’s the biggest and best disco in Dublin.” He was inordinately proud of the fact. The glasses and shower rail in the bathroom were rattling and the furniture was moving around the room within the constraints of the cramped conditions. Was there another room less noisy than mine? The hotel was full mostly with the revelers who wouldn’t be needing their rooms for a good few hours, at least not to sleep. The receptionist said come down and I think I can find you somewhere. Downstairs he broke off from spinning discs and serving drinks to grab my bag and take me out of the hotel, down an alleyway and around the back. There in the lee of the massive bulk of the hotel was a two-story house. Inside the music was still loud but upstairs at the back farthest from the music it was only moderately noisy. I was pathetically grateful and thanked the receptionist profusely before sinking into oblivion. In the morning I realised I was alone in a five-bedroom house with living room, kitchen, three bathrooms etc. Back in the hotel for breakfast, Kieran and John were looking sleepier than I was. They survived the music only to be woken up by the head bangers talking, shouting, screaming, laughing etc. as they left the hotel with taxis screeching to a halt and revving up again from four until breakfast time. The night receptionist was still there as we were leaving. I asked how often they had the late night music. Every night. So how can you run a hotel where no-one sleeps? Everyone knows about it and doesn’t it say so on the website? I didn’t see it but I’ll know next time. Later at the port, waiting for the ferry I checked on the hotel website and there was a link to TripAdvisor where some comments said it was a great night out but most said avoid the place if you intended to sleep in your room at any time and if you wanted your ears to stay stuck to your head. That reminded me that I had seen the complimentary earplugs in one of the glasses by the sink when we booked in but had thought it may have been for those suffering with a snoring partner. 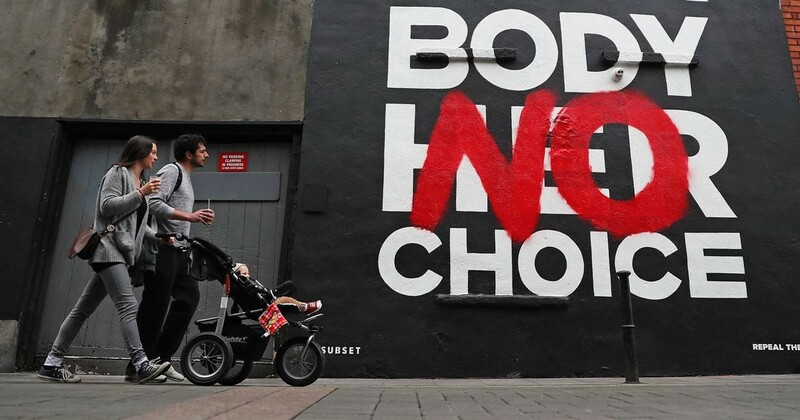 In the end, the people of Ireland voted overwhelmingly for abortion rights and so another example of authoritarian Ireland was gone for good. The question of who will pay for that right in a country without universal health care was not answered and may not be until it’s put to the test by desperate (and poor) young women who might find their only option is, once again the boat to Britain. Will that boat sail through a borderless crossing in the near future? Yes or No?